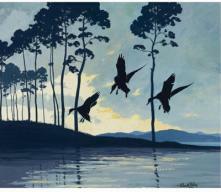 Richard Evett Bishop was an etcher and painter of wildlife subjects, particularly ducks and geese. He also etched a number of Christmas cards which are now in the collection of the National Gallery of Art, Washington, D.C., along with four other wildlife prints. He lived in Philadelphia where he was a member of the Philadelphia Print Club and the Philadelphia Watercolor Society. He was the author of a book titled "Bishop's Birds", published in 1936 by J.B. Lippincott.